AUTOCAD-AutoCAD is a software application for Computer Aided Design (CAD) and drafting which helps in the design of 2D and 3D drawings and models, replacing traditional pencil and paper drafting to create blueprints with easily altered electronic files. AutoCAD is developed and marketed by Autodesk Inc. and one of the initial CAD programs that could be executed on personal computers. CATIA - CATIA is the Dassault Systèmes flagship PLM solution and is the world’s leading solution for product design excellence. It addresses all manufacturing organizations, from OEMs through their supply chains to small independent producers. 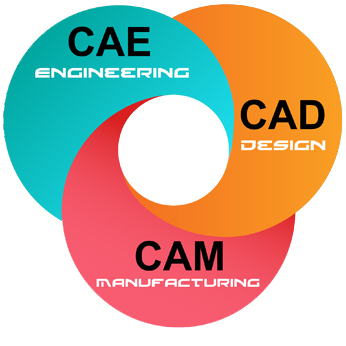 The range of its capabilities allows CATIA to be applied in a wide variety of industries, such as aerospace, automotive, industrial machinery, electrical, electronics, shipbuilding, plant design and consumer goods, including design for diverse products such as jewelry and clothing. PRO E- Creo, from PTC, is a complete suite of concept design, 2D, 3D, simulation & analysis engineering software. What is unique about Creo is that it has taken into account how product design and development is done in modern days, using diverse tools, with the participation of people of a variety of skills, from different geographical locations. MASTER CAM X7 -X7 CAM is a part of Unigraphics NX, owned by Siemens PLM Software, meant for computer aided manufacturing including numerical control programming and all kinds of subtractive and additive manufacturing. 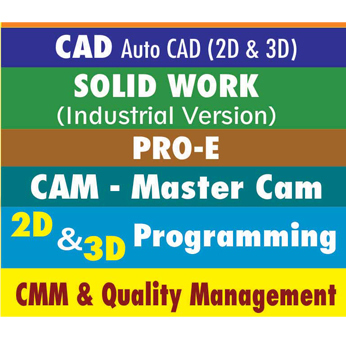 NX CAM is used for doing quality and thorough manufacturing plan- that starts from defining the manufacturing plan to taking it to the shop floor for execution.